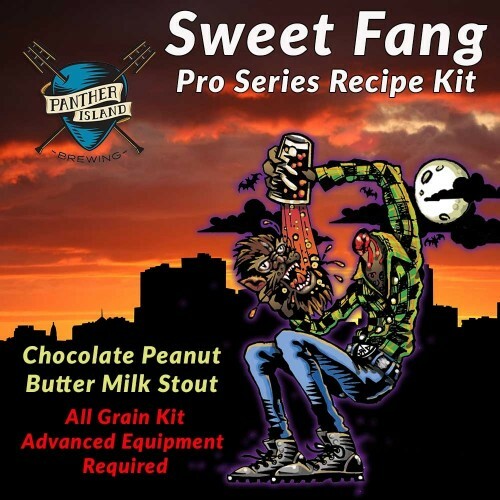 Panther Island Brewing Sweet Fang - Chocolate Peanut Butter Milk Stout - All Grain Beer Recipe Kit - Texas Brewing Inc.
Our friends over at Panther Island Brewing here in Fort Worth are awesome, and so is their seasonal release beer Sweet Fang. Lucky for all of us, they have been kind enough to share their recipe! Thanks Ryan! Cacao Nibs, Peanut Butter Extract, and Lactose combine with a rich grain bill to create this delectable Milk Stout. This all grain recipe kit is only available for a limited time, so brew it while you can! Brewing this right now. The ingredients are all top shelf and it’s really nice that the muslin bag and PB extract are included. Everything is going extremely well and I’m looking forward to my first taste of the finished product. The only thing I changed is to add 8oz of PB2 for the last 15min of the boil...I like my peanut butter! Excellent beer, tasted just like chocolate milk with a nice creamy head.